^ Stafford 2002，第347-348页；企業號1944年3月航海日記：Enterprise (CV-6) War Diary - March 1944 - Page 2 - WWII Archives 互联网档案馆的存檔，存档日期2009-06-14.、Enterprise (CV-6) War Diary - March 1944 - Page 3 - WWII Archives 互联网档案馆的存檔，存档日期2009-06-14.、Enterprise (CV-6) War Diary - March 1944 - Page 4 - WWII Archives 互联网档案馆的存檔，存档日期2009-06-14.、Enterprise (CV-6) War Diary - March 1944 - Page 5 - WWII Archives 互联网档案馆的存檔，存档日期2009-06-14.、Enterprise (CV-6) War Diary - March 1944 - Page 6 - WWII Archives 互联网档案馆的存檔，存档日期2009-07-21.、Enterprise (CV-6) War Diary - March 1944 - Page 7 - WWII Archives 互联网档案馆的存檔，存档日期2009-07-24. Naval War in Pacific 1941-1945 [美國海軍艦隊於太平洋戰爭調配列表]. [2012-07-17] （英语）. NavSource Online: Aircraft Carrier Photo Archive. [2012-07-17] （英语）. 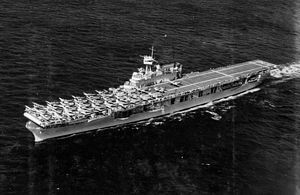 USS Enterprise CV-6 [企業號老兵網站]. [2012-07-17] （英语）. WWII Archives [第二次世界大戰資料庫]. [2012-07-17]. （原始内容存档于2012-06-22） （英语）.